A Colne man tried to make off with a trolley packed with 424 worth of goods from Burnley's Tesco store, a court has heard. 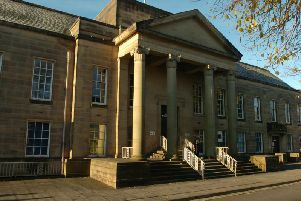 A dad went on a "trolley dash" and tried to leave Burnley Tesco with a £424 haul, after his partner's "raging" drug addiction led to debts, a court heard. Martin Baines had been "desperate," after they had to resort to a local loan shark for cash, the town's magistrates were told. Baines (27) who is subject to a suspended jail term, will be sentenced next week, after the Bench asked for an all -options pre -sentence report. Mr Carl Gaffney, prosecuting, told the hearing the defendant tried to leave the store after a trolley dash, but was detained at the scene. Mr Gaffney said: " All the property, which was a substantial amount, was recovered." Mr Nick Dearing, defending, said Baines, who had some learning difficulties, was a young man who " seems to be fighting on a number of fronts." His long -term partner's Class A drug habit had been raging, the couple had a poorly little girl and they had debts and social problems. The pair were also on benefits. The solicitor said: " Clearly, he is a young man who is crying out for support and assistance. "He is low risk. He is a non- violent offender." The defendant, of Oak Street, Colne, admitted theft from a shop on Wednesday, June 6th. He was bailed until Wednesday, July 11th.